Finally we get to meet our art friends! Pippurit, Mantelit, and Tigers have been making art and sending it to each other since January 2018. Pippurit and Mantelit are from Päiväkoti Pihapirtti in Kontula, Helsinki and the Tigers are from Your School in Olari, Espoo. After months of getting to know each other, themselves, and their surroundings, they got to meet to have a morning of making art together! At first, everybody was a bit confused about the other group. Once we got inside and we heard Project 3 from the Pippurit and Mantelit and from the Tigers, everything started to come together. "Oh! That's my voice!" "I remember that!" "It was winter!". We listened to the sound recordings we had made in March. As we listened, we could draw what we heard. After a while we introduced the possibility to collage using road maps of Finland. One of the great things about this session was how listening to these recordings triggered many memories and ideas that we could then play off of each other in our small groups. For example, one of the groups started to think of boiled eggs as one of the recordings involved a bird. One artist drew snowflakes because at the time of the recording there was snow on the ground. Now it's spring time and everything is in bloom! At the end of the session we had a mini-exhibition where everybody could display their artworks and tell about what they drew. Each small group was a mixture of the Pippurit, Mantelit, and Tigers. Everybody was so kind and welcoming to their new friends! Thank you, Museum of Impossible Forms for hosting Dear You! Have a great summer everybody! 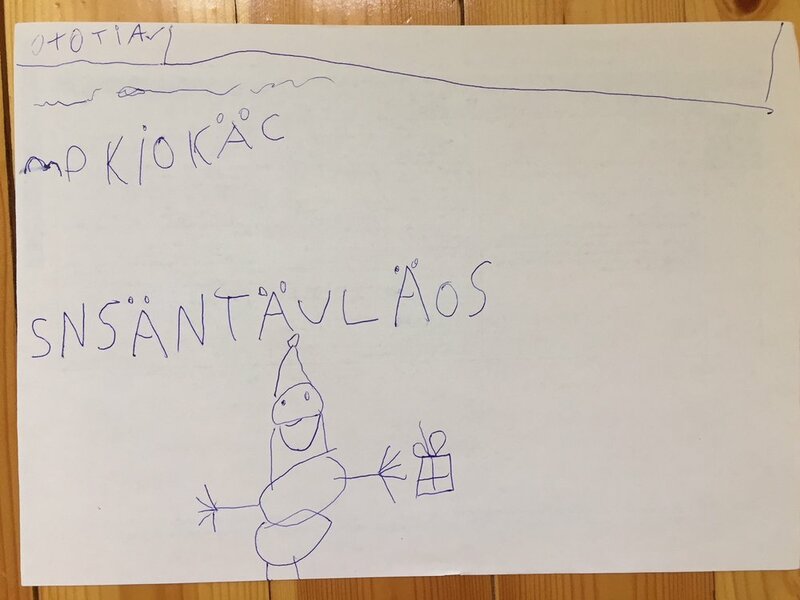 The 5 year old artists at Päiväkoti Pihapirtti in Helsinki, Finland are making and sharing art with the 5 year old artists from Your School in Espoo, Finland. Tämä on kanssa aika hauska! Talvi on jännää aikaa: välillä oli niin kylmä, ettemme päässeet ulos ja sitten hetkessä tuli suojasää. Pakkasella juostessa kenkämme narskui ja aurinko paistoi. Suojasään jälkeen löytyi jäätä ja vettä. Loimme lunta ja rikoimme löytyneen jään, jään alta paljastui aarre: vettä! Vettä ei voinut juoda, sitä varten on ruokavesi ja wichy-vesi. Onko vesillä eroja? Winter is an exciting time: at times it is really cold, so cold that we cannot go outside and then at times comes thawing of ice. When it is freezing, while walking there is crunching sounds and the sun shines. After the thawing ice and water were found. We created snow and we broke the ice. Under the ice treasure was revealed: water! We cannot drink this water. We have water for food and mineral water. How do the waters differ? In winter 2018 Dear You project in Kontula is supported by the Museum of Impossible Forms. Kun palasimme hiihtolomalta takaisin päiväkotiin, meitä odotti ihana posti: saimme kirjeen. Kirjekuoresta paljastui upeita piirustuksia meille meidän omista leikeistämme ja kiinnostuksen kohteista. Kiitos Tiikerit! Nyt olemme itse viikon ajan piirtäneet ja värittäneet kuvia kaavapaperin läpi teistä Tiikeri-lapset. Se ei ollut kovin helppoa, mutta hyvin me selvisimme siitä. Saatte postia piakkoin! When we returned to the daycare from the ski holiday, we had a wonderful package waiting for us: we received a package. The envelope had many amazing drawings, which came from our own jokes and interests. Thanks to the Tigers! This week we have been painting and coloring pictures of the Tigers. It was not that easy, but we managed to make the artworks. You will receive mail soon! Using light and transparency to make art! Using our friend's artwork as a direct inspiration for our artwork is a pure collaboration! At first, the Tigers were wondering how can we do that? How can we make something together with our friends when they live in Kontula? This was the first time the Tigers used tracing in their artwork and they did an excellent job! When they finished tracing we had a talk about the original artwork- what was the photographer trying to say with their image? From that, the Tigers chose colors to try and bring that idea to life. We had a good discussion and compared the original artwork from their artwork they made. Colors and lines, make such a difference even if it's coming from the same source. We learned how we can "say" what we mean. Thank you for being such an inspiration for us! 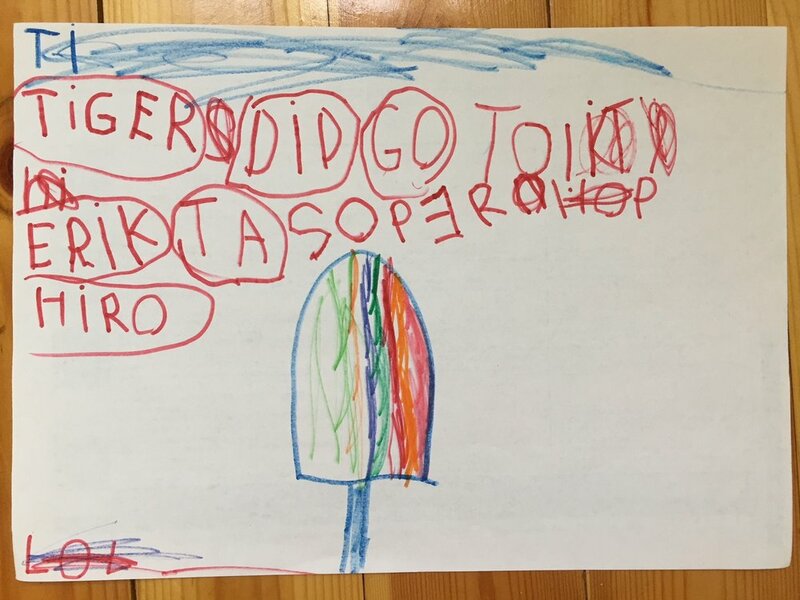 The 5 year old artists at Your School in Espoo, Finland are making and sharing art with the 5 year old artists from Päiväkoti Pihapirtti in Helsinki, Finland. Listen to the Tigers tell 'Joulupukki goes to India' and 'The Ice Cream Story 1'! Who wouldn't be in the creative mood with the smell and looks of these delicious handmade gingerbread cookies?!?! With these in the air of the Tiger's room, we got straight to making the art work for our Full Moon friends in Philadelphia! We started by looking at all of the artworks they mailed us. This gave us inspiration for our stories. We got into two groups and worked together to come up with characters and an amazing story line. Have a listen! These artists create and told the story of Joulupukki goes to India! ps. Joulupukki means Santa Claus in Finnish :). Jumping with joy, the artists of The Ice Cream Story 1 say woo hoo!! The Tigers are so grateful and happy they had this time to make and share art with you all! Thank you and we wish you a HAPPY HAPPY New Year! The Tigers from Your School Espoo, Finland are making and sharing with the Full Moons from Moonstone Preschool in Philadelphia, USA. Both groups are 4-5 years old. foundations. We cut our first mural (the shadow one) into strips. While we weaved we looked at woven baskets and pondered titles. In the end we all agreed to call the book, Banana Sonic Jellyfish Turkey. Here is how we came to our title. Everyone who had a suggestion, suggested. Then we read off the suggested titles and collectively voted on our favorites. There was a three way tie for Banana, Sonic and Jellyfish. So we decided to have all three/ to make it fair, we rearranged these words in a variety of combinations. Everyone, aside from three friends, thought Banana Sonic Jellyfish was the best title. we are celebrating Thanksgiving tomorrow), everyone got excited, so it was added to the end. Everyone loved it, it was unanimous. 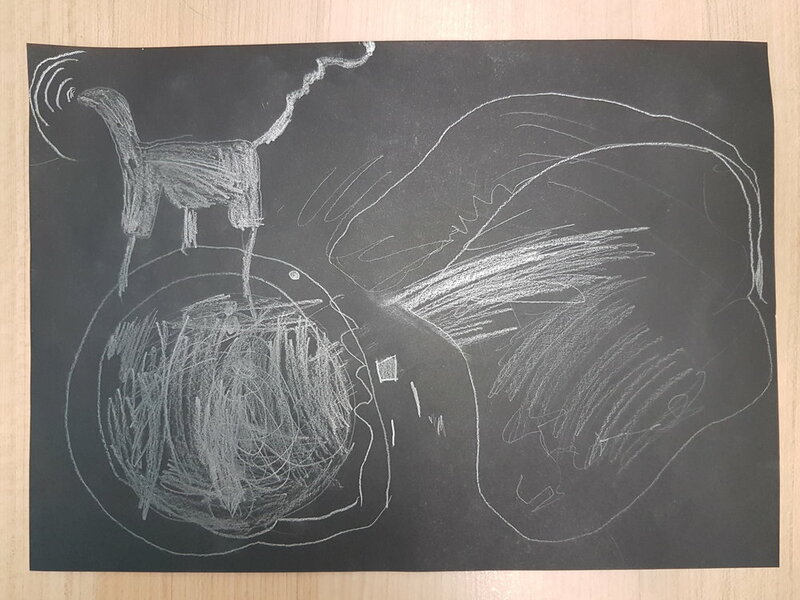 Moonstone Full Moons, 4-5 year olds from Moonstone Preschool in Philadelphia, PA, USA, are making and sharing art with the Tigers, 4-5 year olds from Your School in Espoo, Finland. When I got to Your School I was so happy to hear that another magical package from Moonstone Preschool in USA had arrived!! We opened it and pondered over the amazing questions the Full Moon artists posed to us. In short, YES! We like Halloween too!! For this next project, Weaving Environments, we thought about how the art technique can support the idea symbolically, but also practically. Since the aim of this month's project was to make a book cover, we first talked about the title of our story. How do we unanimously decide on something when there are so many of us? For example, when our friend wants to play a different game from you, how do we come to a peaceful conclusion? The Tigers had so many lovely ideas such as take turns. Seeing that we are such a big group, we thought to take a vote, which is something the Tigers do in the classroom too. Here are the many different ideas that the Tigers came up for the title of their story. Everybody could have one vote. And the winner is Ladybugs!! This was the first time the Tigers had a go at weaving. They all did an amazing job taking their time and making sure that they are going under and over when needed. They got very good at seeing where things need to be corrected, which is a big part when one is weaving. The artists could choose if they wanted to write the title 'Ladybugs' or draw ladybugs on the book cover. I am so proud of them and they are of themselves, which is the most important part!! We hope the Full Moons like our patterns, weavings, and book covers! The Tigers really know how to create a welcoming and artistic environment! They had so many questions and things to share even before we got started with The art of asking questions project! This sort of excitement is the inspiration every artist looks for! We started the session by first looking at the artworks we received from the Full Moons. WOW!! We talked about what their pictures were communicating and was wondering about all sorts of things about our new friends. The questions started pouring out so we made a long list and then founds ways to put image to the text. Vanessa asked, "What countries have you been to?" She drew a picture of the world. Olivia drew a house because she asked, "Where do you live?" Rishitha asked, "When is your birthday?" In the picture, "there are fireworks and my birthday." Mikelis asked, "Where do you live?" He said, "I drew the house. 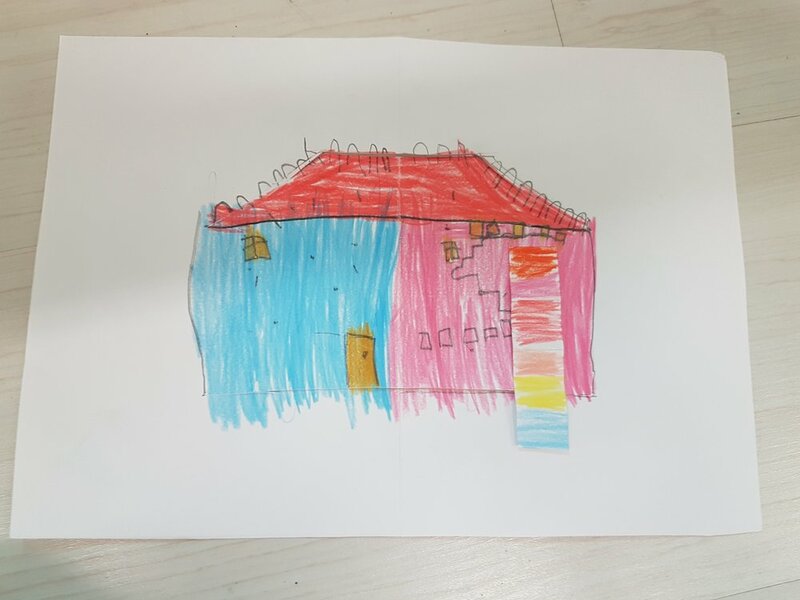 I drew a mother house with a wheel on the top of another house." Nea asked, "What is your favorite food?" She drew a picture of pasta. Cride asked, "Do you like to go swimming?" and drew a swimming pool. Achu asked, "Who is your friend?" 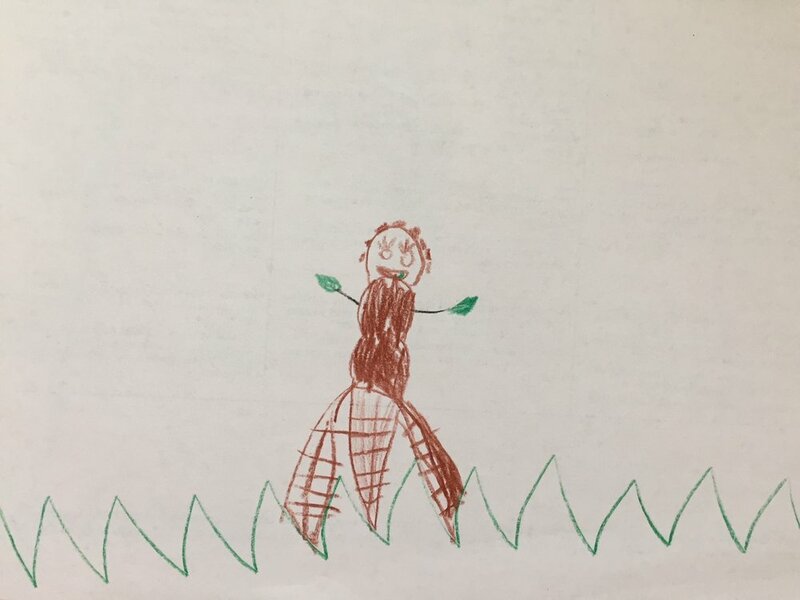 "I drew a friend who is having a birthday." Oskari asked, "What is your favorite shirt?" "I drew my favorite shirt!" Erik asked, "What do you like to play?" "My favorite toy is a castle. It's at home." Aapo asked, "Do you like shark tornadoes?" Arn asked, "What is your favorite shirt?" Renu asked, "What does your room look like?" "It's a picture of my room." Joann asked, "What is your favorite color?" "Rainbow!" Anton asked, "What do you like to play?" "What do you do when you are outside?" We also came up with MORE questions! What do you watch? What house were you in when you were small? Do you have a tv? We hope you like our artwork! We like yours a lot!! Questions are colorful. Stories are colorful. Friendship is colorful. Enclosed you will find our questions on collaborative prints. We wrapped them in our new favorite punctuation... can you guess what it is? This project has turned us into inquisitive printers. Let’s print! Let’s assemble questions! Did you know a printer has four little houses inside it? These houses are called toner cartridges and color lives in them. Each color lives beside another color. There is a red house, a blue house, a yellow house and even a house filled with black, like night. When we have an idea, say a dream, a question, or a story to share, these colors come out and mix together. They can be any color we want them to be depending on quantity. So we mix. To recreate the inner working of a printer we turned ice cube tray wells into toner cartridges and dipped brushed into them to invite the colors onto our acrylic plexiglass screens (our landscape). There was a place space for, red, then yellow and then blue. We added black the next day when we attached our fonts. We created fonts by writing out our vowels, consonants and questions marks onto letter grids. We then cut them out into respective squares and shared them with one another. We also cut our A4 rectangle paper into squares by taking a way a few inches at the bottom. We reattached them at the end with tape as a way of including a space for thought and questions and also as a silly way mix up our questions and pictures. We also made a large mural painting of question marks and color mixing exploration. Other friends in our school helped. We are the oldest kids in our school. We like to collaborate. Questions are colorful and we think letters are the bones of words. What is your favorite color? What is your favorite letter? Have you ever seen a cat? What is the weather like? The Tigers are great storytellers! The Tigers are super welcoming with their big smiles and good creative energy! Today was extra special as I got to tell them that we have new friends from Moonstone Preschool in Philadelphia. Immediately the questions started buzzing and they tried to make connections. They started sharing stories of who they know in the USA and if they have ever visited the country. This was the first time the Tigers had ever made carbon transfers. I am so proud that they all took their time to cover their paper with graphite. The magic started when they began to draw. That's when they got extra excited and thought it was magic at first! Some got frustrated when the marks didn't go through, but they persevered and got it to work for them! When we were finished we all sat down together to look at each other's artwork. The pictures are so descriptive of who the artists of, where they live, and what they like. Erik said, "I am on a bus. I am riding the bus to my home. This is big me and little me." Mikelus said, "I am walking outside and stop in the forest for the postman." Vanessa decided to make a family portrait. Leevi said that this picture is of a happy person. I love the positive image Leevi has about himself! Reno said, "a tiny baby superman is playing basketball with me." Who wouldn't want to play with you?! Can you find the portrait of the carpetman? Which pictures are of a happy person? Which picture has somebody walking through an apple orchard? We are so happy to make a collective book with our Moonstone friends! Moonstone Full Moons + Your School Tigers = MoonTigers! We hope you will enjoy our collective contributions. Enclosed are our portraits along with our handmade transfer (carbon) paper. Feel free to separate them from our portraits and reuse them in your transfer explorations. It was fun (and messy) creating transfer paper. While we worked on our portraits we thought about shadows and became shadow catchers, trying to capture illusive shadows casted by flashlight and lamp. Shadows have no eyes and they do not speak. Sometimes they grow, other times they bend under doorways and hide in dark corners. Our transfer paper making inspired us to take two large collaborative pieces of art and make a huge transfer portrait/piece, representing our unique and collective selves. Like unique individuals, groups are often unique assemblages. We are excited to art pal with you. We are calling our unique collective: MoonTigers. Paint, pencil, charcoal, graphite and pastel are the featured materials in this piece along with our imagination (an essential). We applied our paint with squirt bottles and casted shadows with brayers, tiny little rollers. They really helped us spread the darkness. This large piece was then placed onto (above) for transferring. Here are our portrait samples (below). We look forward to making art with you! Children had fun playing with paper. Folding and unfolding the papers to observe shapes and patterns was interesting. The curious minds were able to observe designs on the papers and connect them with the surroundings. Our inquiry on skin and how it looks was explored further with comparison to the lines on a paper. •Crumple the paper into a ball or fold it as you wish to. •Close your eyes and feel the creases. •Find a section in the paper that might mean something to you. Below were some ideas shared by our children. I folded a paper into a hand fan. When I opened the paper I saw lines. They looked like giant doors. Then I folded it into a paper wand. When I opened the paper, I accidently made a hole in the paper. Then I crushed the paper and opened it. I saw may lines on the paper. Then I painted the paper with red, pink, brown, yellow, blue and purple. I painted a rainbow treasure map. I folded the paper and made an aero plane and opened it. I saw almost a lion face. Then I crushed the paper and opened it. It felt a bit bumpy . It looked like a bumpy design. After I painted it looked like a map. Later I tried to trace over the lines andit looked like a big map with no houses. Later I crushed another paper and made a treasure map with my friends. We folded the paper. Then we opened the paper. Then we folded the paper again. Then we opened the paper. I could see triangles. They looked like mountains. Then I painted it. I painted with many colours. I used the brush to paint a triangle. I like my painting. I enjoy painting. I rolled a paper into a magic wand and opened it. The paper looked flat except for the edge that was a little curved. The I folded it like a sandwich and I opened it and it looked like windows. Then I painted the paper in the middle, yellow, brown and red. Then I painted below, dark blue and light brown. I also painted the top dark green and light blue and red. It looked like rainbow blinds. I folded the paper and opened it. It looked like a machine. It looked like a machine that could squeeze the rubbish. I could stretch the paper and flatten it. Then I painted it and it looked very nice. It also looked like a staircase. At the beginning the paper felt smooth. I made it into a fan. Then I unfolded it and made it into a big plane. Whenunfolded it, I saw small holes . Then I crumpled it and made it into a mountain. Then when I flattened it, there was another hole on the sides. I felt that the lines made a connecting bridge from one city to another. Then I decided to paint an orange bridge.. Then I followed the lines of the paper and painted one whole line green. I painted the other side of the bridge blue. Then I painted a slant line black andalso painted a horizonalline black. The other horizontal line was red and golden. I figuredout that it was beginning to look like an Australian flag. I crumpled up a paper and then I opened and saw the shapes. I saw lots of roofs. Then I folded it and opened it up again. I did this a few times. Then I flattened it. My paper looked like lion’s face because it had one diamond and four triangles. Then I used orange to paint and then I used purple and then I used light pink. Then I used orange but it was like orange because it was brown. Then I used dark pink and a little bit more dark pink. My picture looks like a rainbow sun. I crumpled a paper very hard and it became like grandpa and grandma’s skin. Then I tried to connect the lines to form a lion’s face. But as I was painting I realized that it was beginning to look more like a Bison . The lines looked as though the bison was bending down eating grass. It also looked like a bumpy wall. I folded a paper into a plane. ThenI unfolded it and made a boat. Then I crushed it and folded it again into a rectangle. Then I opened it. When I unfolded it, I saw six rectangles. Then I painted it. I painted with purple, orange, green and yellow and dark pink and dark purple and light pink and dark green. I added more lines onto it. I painted a bit of red on one of the sides. It looked like colourful doors. Then I crumpled another paper with my friends. ThenI made a treasure map with my friends. The 3-4 year old artists from EtonHouse Bilingual Pre-school in Singapore are making and sharing art with the 3-4 year old artists from Oakdale Montessori Preschool in Cape Town, South Africa. We at Oakdale Montessori really enjoyed this project as it touched on a part of our curriculum. With our theme being the Universe. We’ve been learning about all the planets and we were able to zoom in to show the children that there is more than just one continent that they live on, on the planet earth. We showed them that the earth is round with our Continent Globe and showed them how to read it as a map on a 2D surface. With this we showed the children that the only way to get to our “Dear Art” friends is by an airplane or by ship and that is how we will be sending our art. The children pointed out where we lived and then where their friends are. Hope you enjoy our art as much as we enjoyed making it. The 3-6 year old artists at Oakdale Montessori School in Cape Town, South Africa are making and sharing art with the 3-4 year old artists from EtonHouse Bilingual Pre-school in Singapore and the 1st and 2nd graders from Grunnskóli Fjallabyggðar in Siglufjörður, Iceland. Shadowing our shadows in Singapore! Moving from shadows of constructions to shadows of people was interesting. Shadows that move and shadows from still objects differ. Sometimes objects do not move but their shadows do. When Arlene shared a sample of a picture of shadows, I pondered how children might think and draw about their shadows . 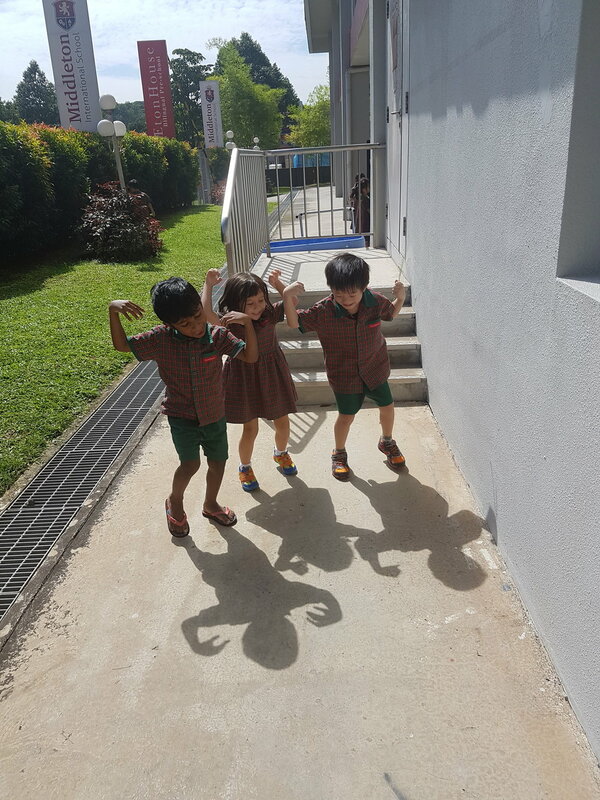 Initally children drew the shadows of their friends at the carpark.. Then they drew shadow images of their friends on the paper. It was tough for friends to keep still. But what was even more challenging was drawing their own shadows. They shared that it was nearly impossible after trying. Watching a shadow drama on youtube helped children realise that they could actually form different shapes with their body. Sometimes the shadows do not look anything like how we expect them to be. E.g. Caitlin formed the shape of a table but the shadow formed under her was different from the shadow that appeared on the side wall. The shadow did not appear like a table on the floor. Sometimes they look abstract and formless but at times they look like something else, decieving our eyes. Jordan: Can you see an elephant spraying water? Can you see a lion eating a Zebra? Can you see a giraffe trying to fight a tiger? Oops! I forgot to draw the tiger! Xi Wen: Can you see a giraffe? Can you see a dinosaur? Can you see a sea-lion? Can you see a chair and a castle? Lin Jia Wen: Can you see an elephant eating a carrot? Can you see a Prince and a Princess? Oliver: Can you see a lion growling? Leeann: Can you see a panda at the Zoo? Can you see the Prince and Princess too? Emilia: Can you see a giraffe eating leaves? Can you see a human shadow? Caitlin: Can you see lines inside each of the shadows? But how can a shadow dance by itself? Advaith: Can you see armours here? Can you see a dinosaur roaring? Aahan: Can you see a shadow of a lepoard? Can you see the shadows on my name? Avinaash: Can you see the shadow of a tiger? Can you see the shadow of a tall building and a house? Here are pics of a few of our shadow drawings. The children used different mark making techniques in white crayon around their shadows to had more complexity to their works. We looked at Cy Twombly's paintings to think about mark making. Catching our shadows was actually a little challenging as we had some cloudy days here this winter! Plenty of sun now however! KG2B class from Collegiate American School in Dubai, United Arab Emirates are making and sharing art with Class 1 from Sneinton C of E Primary School in Nottingham, UK. We introduced this theme in a very special way. The class sat in a big circle and closed their eyes. The played the Montessori “Silence Game” which is a calming, meditation like game which allows the child to use their senses like hearing. Once they closed their eyes, I asked them to tell me what they can hear. We got the children to paint, colour in and stick paper to make 3 sounds that they heard. When we realised that the topic on 'Building a Home' has come up again after Lay of the Land, there was a room for doubt about how differently children might react to the same theme with little twist in the provocations. Our children gave physical descriptions of their homes by talking about the shapes and surfaces and made comparisons with their peers'. 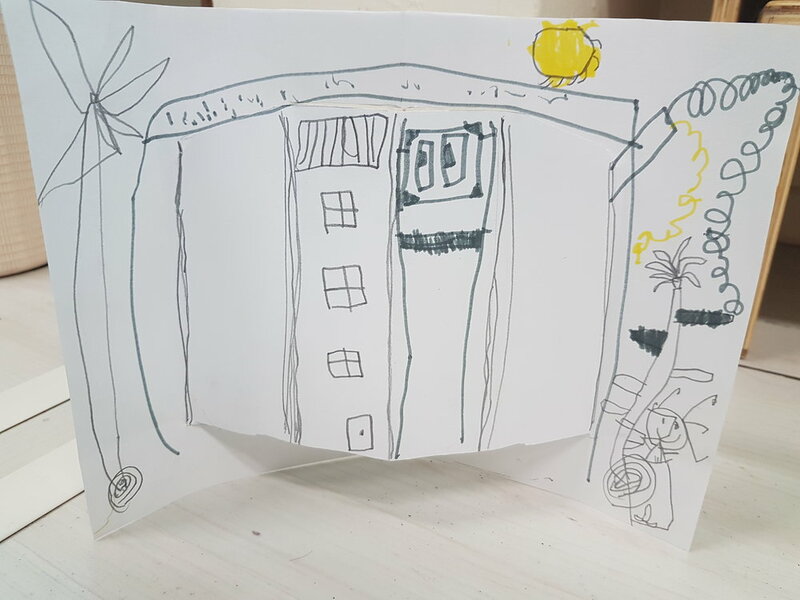 During our whole group meeting, children shared about how they could connect all their pop-up homes and make a City not realising that it was the intention of the Author too. Interviewing each child based on the suggested questions gave us an insight about individuality in their thinking. Creating a pop-up home encouraged children to think about dimensions in their homes. They loved it. Your home says so much about you. What is your home like? Is it in an apartment complex or is it a single building with a garden? What do the surfaces of your home feel like? Think about others who live in this home. What if you could fold up your home and take it everywhere with you? What parts of your home would you want to carry with you on your travels? Avinaash: My house has a rectangle roof. There is an automatic door too. There is another door which you need to use the key to open. It is a single building with a garden. The floor usually feels cold. My daddy, Mummy, me and my brother and my Grandmother stay with me. I would love to take my plane room along with me wherever I go. There are many toys in that room. Jing Ru: My house has a rectangle roof. There is a gate at the garden. There is a staircase near the garden. The staircase will take us to the shoe-rack where we put our shoes. It is a single building with a medium sized garden. My Mummy, Daddy, me and my two aunties stay there. I have a very big dog too. I would like to carry my playroom along with me where ever I go. It makes me feel happy. Emilia: My home has a dining area and there is where you walk then you see the study room and then you can see my room and then my Mummy’s and Daddy’s room. I have a balcony. I have a tricycle out at the balcony and a small scooter and one balance bike. I live in a condominium where many people stay in one building. There are three swimming pools at my place. My sofa feels soft. My floor feels hard. I would love to bring my room wherever I go because it makes me happy. Caitlin: My house has lots of pointy things outside. The driveway of the hall is cracking. It is very old. There are rectangular windows on the first floor which are very big. They don’t have grills. You can just unlock it by pulling something up that makes a click sound and slide the window. I feel that my home is bigger than the school but I don’t think so because it only has two levels. I would love to bring my toy room along with me wherever I go because it has many toys. I have got a lot of games to play with you. Jiang Xi Wen: There are many trees near my house. When I take the lift, I see some lights in the lift. Once the door opens you need to walk to the house with the white door. When you open the door you will see my brother making a tree. He is making a decoration. My mummy, Daddy, brother and sister stay with me. I like to bring my kitchen wherever I go because there is so much fun in there. I can make bubbles in the kitchen by filling a cup with water and adding soap. Aahan: My home is white and green. I live in a tall building together with other people. It also has other condos. My sofa is soft and the wall is hard. My floor has some kind of rock designs on it. My Mummy, Daddy, brother and aunty stay with me. My friend Etsa visits me sometimes. I like my bedroom the most and would like to take it along wherever I go. I have a bed which opens up. You can find some pillows, blankets and bed-sheets in there. Oliver: There is one bed for my Papa and Mama and one bed for my sister and a bed for me. I have one big pool and two small swimming pools. My sister likes to play in the toy room. The toys are supposed to be in the living room but they are on my bed. There is a garden next to my home. My floor is smooth and white. I would love to take my toy room wherever I go. I can play the toys. But when it is time for us to go out, we cannot play. Lin Jia Wen: I live with my Mom, Dad, brother and my aunty. My sofa feels rough. My floor is white. But the floor in my Mummy’s room is brown. My brother’s room and my room are also brown. My house is in a tall building. Other people also stay in the building. There is a car park outside my house. My Mummy parks her car there. I like my room the most. I would like to bring my room wherever I go because my Mummy allows me to draw on my own room wall. Jordan: My house is like a nature park because there are many flowers and plants growing in my garden. My Mom and uncle grow them. My Daddy, Mummy, sister and aunty stay in my house. I have two pet dogs and one cat. My cat is a good climber. You will see my door and staircase when you enter my house. I have a baby doll in my room. I would like to bring my bike wherever I go. Advaith: In my living room, the floor has got some square patterns. In my room, the flooring is similar to those in my classroom, wood floor, goldenish brown. The walls are bumpy as though they have mini mountains on the walls. My parents share the home with me. My house is on level three but there are people living above my level. I would love to bring my own bedroom wherever I go because it is so full of toys (although it is not possible). Julian: My bedroom has powder, body-cream and toys. I also have train tracks and trains. My floor has square patterns and marks on it. My wall is smooth and white. My sofa’s armrest is hard. The back part is also hard. The bottom is cushion and is so soft. My Mummy, Daddy, Grandpa, Grandma, Tita, Oli and Kristin share the home with me. I have a muslin blanket on my bed to smell and fall asleep. Zhu Yu Hang: My house has a lift. I live on the third floor. I have to take the lift everyday to go back home. My house is grey. There is swimming pool down stairs. There is a toy in my house. It is my favourite. It is a rocket. I take it wherever I go. Children were conversing about hearing the Rooster crow in the mornings. But did they really hear the rooster crow or was it something they have read from books? (In Singapore, we do not have farms. We could probably find chickens at the Singapore Bird Park). They shared that sometimes they hear things but don’t get to see the things. E.g. noisy garbage truck, birds chirping, dogs barking. The children were given an opportunity to think about their individual environment and the noises heard. Even the noises heard at school differ from that at home and sometimes similar. Children expressed themselves through drawing (paper, markers and pencils) and spoke about them. We started by asking ourselves what home means to us. Then we went outside and in pairs, pretended we were visiting each other's homes. We described our homes, what they look like, what is outside in our gardens, playground, etc. then we came back in the classroom. We closed our eyes and imagined we were coming home from school. What does our front door look like? Do we live in a villa or apartment building? What is outside our home? We thought about these details and then began by making a drawing of our homes. Half way through class we came together and shared a few drawings. We made positive comments and then added one or two things that we thought could be added to the drawings shown, like the people who live in the home, the number of the house, etc. we also talked about what makes Dubai different from other places. What types of trees do we have (Palm and others), are the shapes of our roofs and villas unique? Then we went back to our seats and added more details. In the second class we reviewed our drawings and used them to help us create the pop up card in color. Below are photos of KG2E art works. KG2E class from Collegiate American School in Dubai, United Arab Emirates are making and sharing art with the Tigers from Your School in Espoo, Finland. Below are selected artworks from KG2D. KG2D are making and sharing art with the Monkeys. The young artists are 4-6 years old. We are larger than life! Toti, Zeynab and the Tigers were getting ready to create pop ups! They could not wait to show me and their friends in Dubai the dinosaur helmets they made! We started the workshop with taking a mental journey to our home. What do you we see in the living room? Which couch do we like to snuggle up on? How does that couch feel? After taking a tour we looked closely at different kinds of texture. We then practiced different drawing techniques on how to create texture. Putting all of our knowledge together we created our pop-up homes that tried to capture what we like the most in the place we feel at peace. Nit: A chair I use to relax. All my family can sit on it. It's gray, black and white and it's very smooth. Neh: I have a sofa in my living room I use to relax and watch tv. It's made of hard cushions. I also have an eating chair. Raf: I have a soft bed with pillows. My home is very colorful. Vih: I have a gym room in my home where my mommy keeps my cloths. I have a toy dinosaur that is rough and I play with it. Ume: My home has a seat in the living room. We eat there. Our seat is big. It's cold and icy, it's blue and yellow. We have pictures of stars, moons, and snowflakes. Pau: This is my sofa. It's in my living room and it's white. It's a little bit hard and it's made of wood. Adr: In my home there is a sofa in the middle and there are some decorations on the carpet. The sofa has white, red, green and brown decorations on it. The sofa is made of wood and has comfortable cushions. Dha: This is my home when I was a baby. The sofa was brought by my mom and dad. And while my big sister was at school I always sat on the sofa with my mommy. The sofa is brown. It was soft and comfortable, but now it's a bit old. Lil: This is my kitchen where I eat food. There are 2 chairs. One is my sister Elle's and the other one is mine. My chair is made out of wood and some soft material. Ath: Here is my living room. There is a big tv and black curtains. We sit on the ground and chairs. The ground is soft and brown. I like to sit on the ground to watch tv. Welcome, friends, to our home! The 4-5 year old Tigers from Your School in Espoo, Finland are making and sharing with the 4-6 year olds in KG2E from Collegiate American School in Dubai, U.A.E. Dear You is about making friends around the world through creating and sharing art. All Dear You participating schools are organized to have a Dear You friend in another country. For example, a class of six year olds in Greenland will be paired with a class of six year olds in Finland. School teachers or hired Dear You workshop leaders living in these countries will go to the schools in their respective location and hold workshops for the children in the school once a month. During these workshops the children will create their art projects, which will then be mailed to their Dear You friends abroad. Using Ipevo learning tools, Dear You also has a digital dimension where we meet each other and talk about our artwork online. Dear You focuses on the process of art practice, opening dialogue, and discovering our surroundings! Feel free to contact us to find you how you and your young artists can get involved by emailing arlene.dearyou(at)gmail.com. Dear You, Thank you! Kiitos! Tack! Tak! þakka þér! Takk! 谢谢! Cảm ơn bạn! Aitäh!